One of the most essential parts of starting a new business is choosing the right name for it. Get that wrong, and it’s no exaggeration to say that your enterprise could be sunk before it ever has a chance. In order to avoid such disasters, we spoke with Shane Hebzynski from 3 Cats Labs, a flexible creative branding agency. 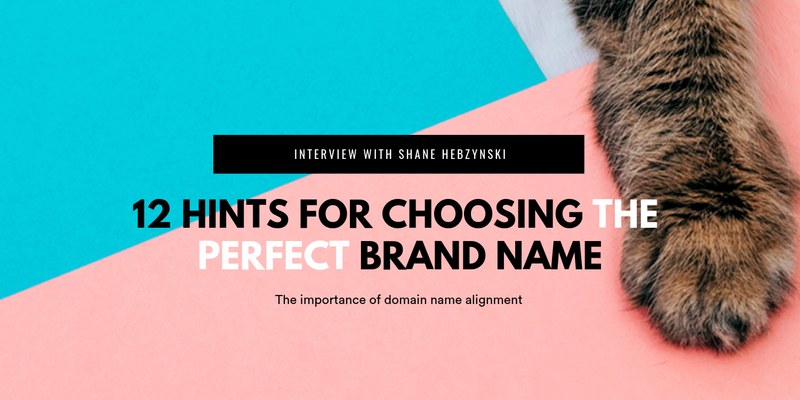 He gave us his 12 hits for choosing the perfect brand name, some of the most common mistakes made when creating or choosing a domain name, and some tips on how to avoid them. So, let’s start! What is your definition of a Brand? It’s the DNA or personality of your product or business. It’s more than just a logo and some colors. It’s what makes the first impression, shapes the customer experience, and represents the connection between people and your business or product. How did you get into branding? What do you love about it? I actually kind of got into it by accident and discovered I liked it during my university studies. At that time, my university major was International Relations. Eventually, I had more opportunities to be involved in branding and my interest grew from there. I love the whole process of researching and putting the pieces together to come up with a final product. The shaping of the brand is what I love most. What are the key factors to consider when choosing a business name? You need to ask yourself if the name is it memorable, is it different, how does it sound when it’s spoken. Another thing to keep in mind is its international usability. You don’t want a name that is negative in a market outside of your home market. What are the mistakes companies make when choosing a brand name that you see most often? Lately? Two things come to mind instantly. One is picking a random word and dropping the vowels. The other being the two-word mashup. Is there fashion in branding, are certain things trendier than others? The trends do change. At this time, you can expect to see bright colors and also gradients making a comeback. Also, with typography, you’ll see more variable fonts being used. Do you advise your clients on domain names? What importance do you give to the domain name they choose for their business? We always recommend a domain name that has your company name in it, which is the most important factor because it’s something that people will remember. Also, if it makes sense for your industry or company purpose, it does not mean it’s always applicable. Is it fair to say that nowadays companies should brand with global mindset even if they are local? And if so, what does that entail? Definitely. The internet has made every business global. We’re based in Singapore but most of our work comes from clients outside of Singapore. Yes, Singapore is a small country, but even a person making cat collars at home, if successful, will be receiving site traffic from international locations and will likely have international sales. Very few businesses are strictly local. Keep in mind how your brand’s name might mean in other languages and have what you need ready for when that international customer contacts you. It might be wholly unexpected. Has the internet made it easier or harder to build and maintain a strong brand image? I’d say it has actually made it easier. There are so many more tools available to get the word out about your brand. Yes, there is more noise and that’s why branding is an investment. People that see branding as a cost and can fix it later; those are the brands you’ll see disappear. What is the craziest story you’ve had with a client? Once there was a company that needed a new website. Everything had proceeded smoothly and the website was completed. The client just stopped replying to emails and would answer the phone but was too busy to talk. For the next 6 months, we sent reminders every 2 weeks to transfer the website to the client’s server. Absolutely no interest. 1 year later and the client asks where their website is. Fortunately, that was before I started 3 Cats Labs. How did you come up with your brand name 3 Cats Labs? What is the story behind it? Well, I had been thinking of names for a few days had a narrowed my list down to about 3–5 that I was seriously considering. Then one morning I woke up and had the name “3 Cats Labs” in my mind. I do have 3 cats so there is that part that must have subconsciously inspired the name while I was asleep. I knew almost instantly that 3 Cats Labs would be the name. I still gave it a day to run through my mind, and it felt more right than the names I had thought of before. How did you get the domain for it? Fortunately, the name 3 Cats Labs isn’t too common. At least on LinkedIn, there isn’t any other company name with a 3 Cats name. I did a quick search just to see if anything came up and nothing did. So, I logged into my GoDaddy account, searched for the domain and 3catslabs.com was available. By this time, I was sure of the name so without hesitation, I purchased the domain. If you could have any name in the world and the domain name to go with it, what would you have? I think I’m actually happy with what I have now. It has a meaning, people remember it, and it gives people a good giggle. It also makes them ask about the name and the company. Creating a brand identity from scratch? 3 Cats Labs work across industries and offer a full spectrum of creative branding, design, and marketing services.